"When our youngest son was born, we were horrified. His fingers on hand and feet were fused. I haven't seen anything like this before. He is now 2-year-old, he cant hold anything, not even a pencil. He can't eat his own food. He hardly takes few steps. Sometimes he cries uncontrollably in pain. It is painful to see him suffer at this age. I can't imagine him growing with this pain and trauma." - Mamatha, mother. Mamatha and Nagesh live in a village in Hyderabad. 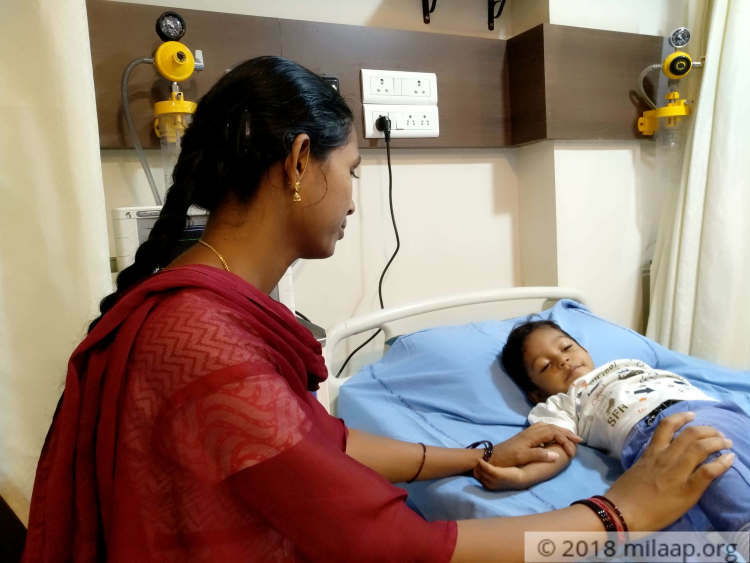 Mamatha's pregnancy was smooth and the scan reports did not reveal about the deformity. 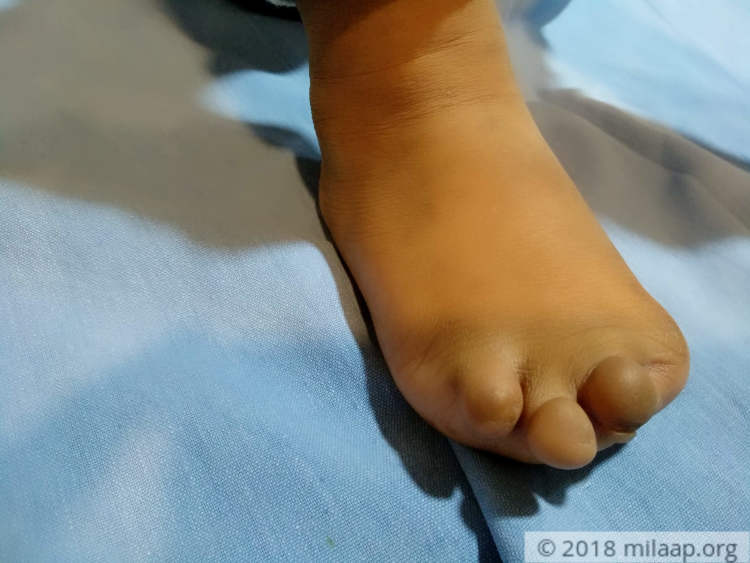 Their son's deformity was a big blow to the family. 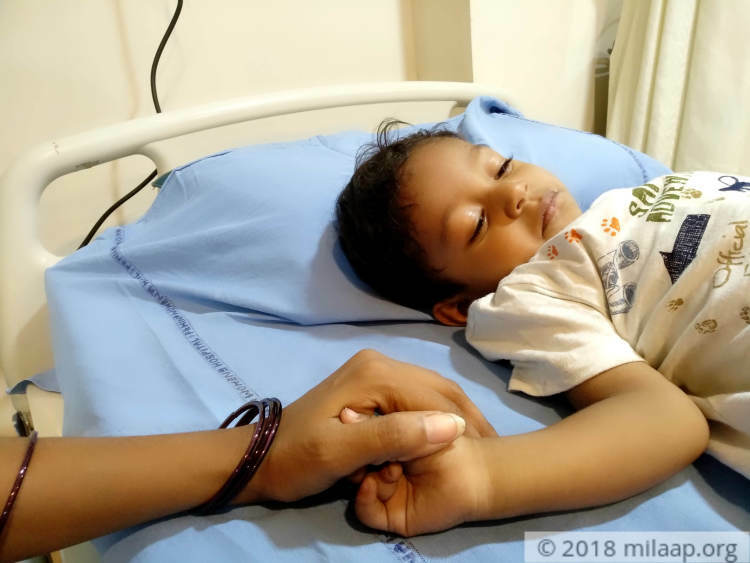 Since then, they have taken him to several hospitals but nothing has helped their little son Hanish. Doctors have said that only a surgery can help to fix his deformity. "Doctors said not to delay the surgery because it will lead to coordination disorders and his nerves will be affected. I'm not educated. I didn't understand completely what the doctors said but I know that my son's future will be lost without this surgery. While the children of his age are learning to speak, walk and hold things on their own, my son is struggling to do even basic activities. He has not learnt to speak on his own but repeats whatever we say. It is painful to see him in this condition. "- Nagesh. Little Hanish has never been able to play on his own. He needs someone's help. His elder brother Teju (10) helps him to hold things and he even feeds him. His parents keep away all the sharp objects away from him and the toys that have sharp ends because even a small scratch causes him terrible pain. "I can't imagine him to live with this deformity throughout his life. How can he manage? How will I console my son? We are poor family, I work day and night so that my children can go to school and have a good education but with this condition, he can't even step out of the house. I want my son to have a normal life like any other children." - Nagesh. Nagesh works in a furniture shop and Mamatha is a housewife. Nagesh has to take care of his elderly mother also. 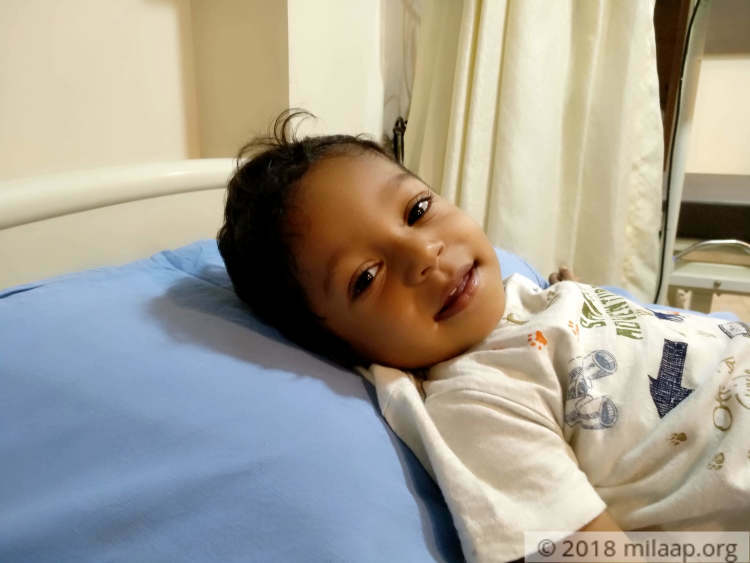 His family is willing to sacrifice anything for little Hanish but they do not have anything left to get the surgery done. They have been spending sleepless nights and every passing day gives them unfathomable guilt and pain. They feel helpless. "Only a surgery can help my son to live a normal life but I can't afford so much. I don't own a house, we were just managing to run the family every month with my salary. My relatives and friends helped us but still, all I have is few thousands with me. Now I don't know whom to turn to help." - Nagesh. Little Hanish is in excruciating pain and his deformity does not allow him to do any basic activities, he can't eat his own food. He needs the surgery at the earliest to protect him developing other disorders and nerve damage. His parents have nothing left with them. 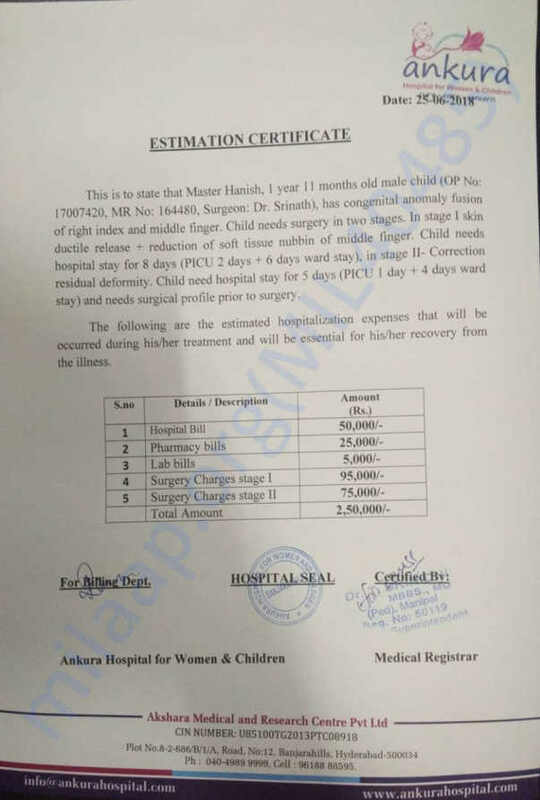 They need Rs 2,50,000 for the surgery. Only your support can help Hanish. Thank you for the love shown towards Hanish. 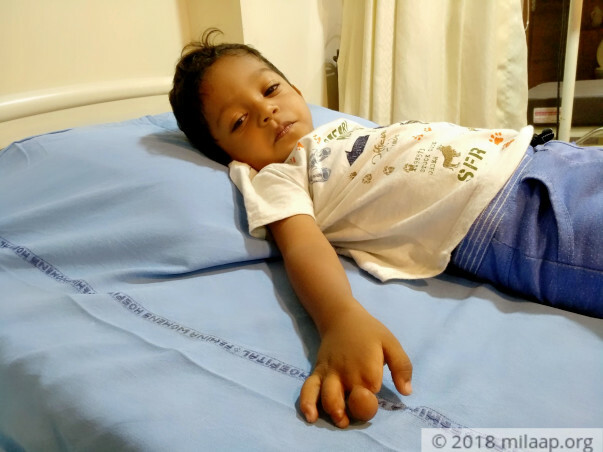 He is presently at home after undergoing one surgery for one of his fingers. He is at home recovering and has been given medications as well. He requires a few more surgeries but due to a lack of funds we are unable to go ahead with them. We request you to continue supporting him by sharing his campaign with your friends and family. I am grateful for the love and support being given to my son Hanish. I would like to inform you that he is still at home being treated with medicines as we are waiting for the funds for his operation. We have exhausted every source available for his treatment, and you are our last hope. A sincere request to all of you to kindly share the campaign and pray for his health as we are in urgent need of funds. Thank you all for the love and support. Thank you for the love and support. 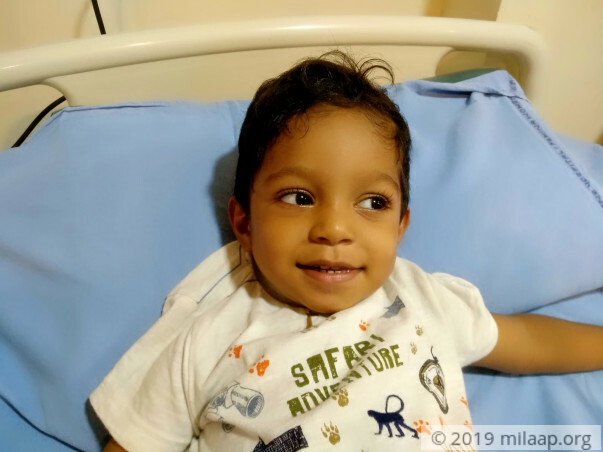 Here is an update on Hanish's health. Currently, he is at home and doing fine. He is on regular medication as prescribed by the doctors. He is in need of funds for the surgery. We request you all to help him . God is with you don't worry. Just Take god's name.